Hallem is a type of stew made from pounded wheat and mutton into a thick paste. It is main item For Muslims during the Holy month of Ramzan (Ramadan) . 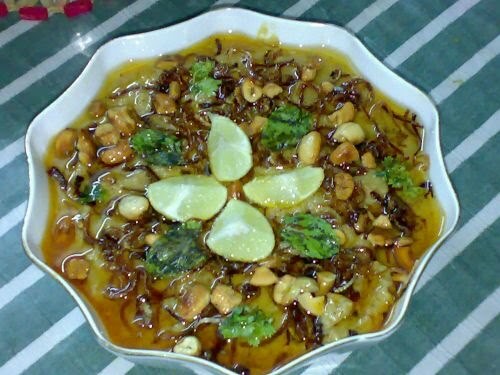 It is a tradition to break the daily fast (roza) at Iftar time with a plateful of haleem. What are Ingredients for making Haleem ? For Making of Hallem we use the following items Like mutton, cracked wheat, lentils, ginger & garlic paste, turmeric ,spices and hot topped with ghee based gravy and finally make Garnish with lime pieces, coriander and fried onions . How To Prepare Haleem Dish ? Haleem is cooked on a low flame for over 10 hours in the bhatti , mixing it thoroughly with large wooden sticks through out its preparation, until it gets to a sticky-smooth Paste. Advance happy ramzan Vurooz Bhayya..